Picture this: Less than three years ago, a young woman stands in the middle of a grocery store. She is lost. She just started to learn about the country and the language and why do people use the word “stuff’ for everything, and she is lost in the middle of a grocery store. Standing in the breakfast section in front of a gigantic range of jams, she reads all these labels: jam, preserve and jelly. She is lost. She knows what jelly is, but what about the two others? What’s the difference? Which one is "confiture"? She starts looking at the consistency of each and every one of them to figure out which one is jam. She didn’t expect to see all these names. Looking for a sign, some help, a dictionary may be. She goes back and forth, watching what people would pick the most from this pile of sugary jars. She figured this might help her. No, still lost. She finally picked the one that looked the most familiar to her, hidden in the world section and written in French: Bonne Maman apricot jam. She went back home, turned her laptop on and looked for the definition: Properly, the term jam refers to a product made with whole fruit, cut into pieces or crushed. The fruit is heated with water and sugar to activate the pectin in the fruit. The mixture is then put into containers*. The term Preserves is usually interchangeable with Jam, however some cookbooks define Preserves as cooked and gelled whole fruit (or vegetable), which includes a significant portion of the fruit**. 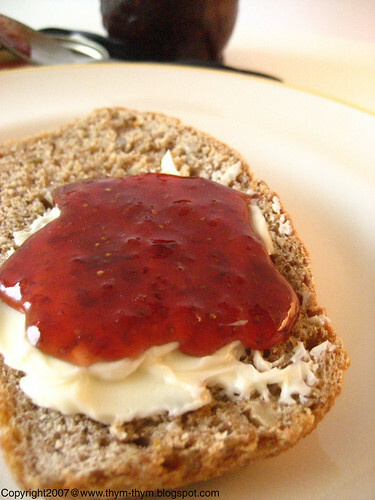 So jam and preserve are the same, she tought. Why do they make it sound so confusing? Lost, she was no more. Came the summer, she was determined to make her own pots of jams for the winter to come. This way the only dilemma she would have to face will be to either spread her jam on a slice of Rye and orange bread or a tart shell. Jam jars should have lids and rings that help creat a vaccum seal. Ball and Kerr are good brands to use. When sterrilizing your jars, use canning tongs, specifically made for gripping jars. They are very helpful. Some fruits (like apricot, pear, mango, watermelon, green tomatoes..etc) need to macerate in sugar for 24h before cooking them. Adding lemon juice when starting the cooking process help preserve the natural color of the fruit. Usually the rule goes, for every 2 pounds(1 kilo) of fruits add 1 ½ lb(750g) sugar or 1 1/3(600g) if the fruits are too sweet. 1- always keep an eye on them. 2- Have them on medium-high heat and stiring regularly. 3- Never put the lid on as it will overflow and you also want the jam to thicken by evaporating. 4- Skim the foam that might form on top. If you have a copper pot, use it to make jams. It is the best tool, according to chefs, for jams. It conducts heat evenly and alows pectin molecules to interact between themselves. If your jam has crystallized, slowly add some boiling water to dissolve it. 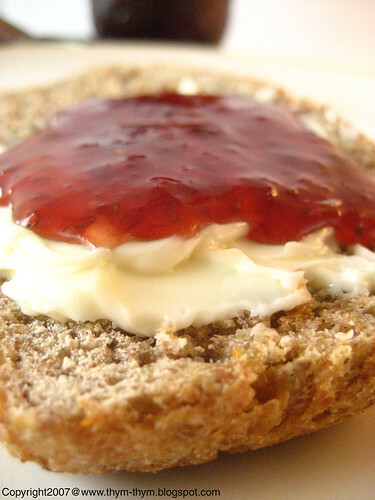 An easy tip to know when your jam is ready: Put a little bit of it in a spoon and set aside for 30sec. If it rinkles when touching it with your pinkie, then it’s ready. If not continue cooking it a bit more. Try again later. - Apple: vanilla, cinnamon, anis star, cardamom, lemon balm, rhum, lavender, rose water, mint. In a large, deep skillet, pour the lemon around the sugar. Cook over medium heat undisturbed until most of the sugar starts to melt. Gently stir the sugar until completely melted. Using a moistened pastry brush, wash down any sugar crystals from the side of the skillet. Add the strawberries and boil over medium-high heat, mashing them gently then, if you don’t like to have pieces of strawberries in your preserve, puree them using a long stand mixer. Let it cook until it reaches 220F (or 8 degrees above boiling point, depending on altitude), about 10 min. Continue to boil until the preserves are thick, about 4 min longer. Dans une marmite profonde, verser le jus de citron autour du sucre. Faire cuire sur feux doux, sans le remuer jusqu’a ce que le sucre commence a fondre. Remuer le sucre doucement a l’aide d’une cuillere en bois pour que le sucre soit completement fondu. A l’aide d’un pinceau a patisserie, legerement mouille brosser doucement tous cristaux qui peuvent se former autour du sucre. 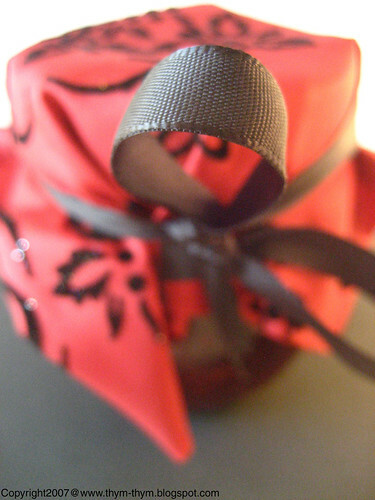 Ajouter les fraises et porter a ebullition sur feu relativement élevé. Ecraser les fraises ou si vous ne voulez de morceaux dans votre confiture, broyer le tout a l’aide d’un mixeur a soupe. Laisser cuire jusqu’a ce que la confiture atteigne 104 C (ou 4 degres au-dessus de l’ebolution dependant de l’altitude), environ 10min. Laisser bouillir, sans couvrir encore 4 min, ou jusqu’a ce que la confiture soit epaisse. I love homemade Jam and I enjoy making it. I find it very relaxing and the smell is wonderful. I so enjoy making jam, and the season is here, lovely! I have been seeing posts on jam making, and I want to make some!! I don't think it is going to happen this year, but I will be prepared for it next year! Hi Rose, thanks so much for your tips and instructions. It's so much clearer and less confusing then the instructions I have from a book. I like to know the reasons why I have to do certain things, so it's good that you explained it. So far I've only made rhubarb & apple jam, marmalade and fig & ginger. I would like to make more with stoned fruits (e.g. peach) when it is in season again. Rose, what a lovely post! I love homa-made jam, too. I still have some peach jam that I made last summer. Hopefully it will last me until summer, when stoned fruits are in season again! A wealth of knowledge here Rose. Super good Jam. Or is it preserves! Easy confusion. Rose, my dear, I wish I were your neighbor!! LOVE making jam! You've thought up some wonderful combinations. Yum. I have a bunch of fresh blackberries lying around, and your post just inspired me to look into making jam! By the way, I'm a new reader. I hope you don't mind if I link to you! trs bonnes idées d'associations de saveurs à venir pour ces confitures . Et de précieux conseils . - Shayne, I agre 100%. - Kelly-Jane, this one of the reason why I love summer. - Deborah,Can't wait to see what you will make. Happy Jam making then. - Nora, you are so very welcoe my friend. Your jams sounds delicous and ig is by far my all time favorite. 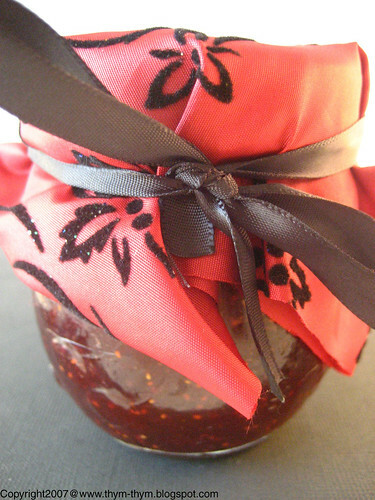 - Anh, Jams are the best thing that can keeps you warm dyuring winter. - Tanna, Thank you very much my dear. - Patrica, my dear, if you were my neighbor I would bring you pots of jam every time I make some. By the time winter comes, you will have a pantry full of it and would ask me to stop bothering you with jam. - Samania, c'est la maniere la plus rapide, effectivement. - Wendy, I am glad you enjoyed it. - Welcome Nan, glad to here that it inspired you. - Bonjour Lili, tout le plaisir est pour moi. Mima, si tu etais ma voisine, je serai la fille la plus chanceuse au monde et pour plusieurs raison!! I love making jams, like my mom and her mother before her. I love adding fresh ground black pepper to peach or nectarine jams. I use 3/4 of the fruit weight in sugar however and let it reduce until almost caramelized. My favorite is quince jelly. Miam!